The February 2007 issue of National Geographic Adventure included a feature article on the Gunflint's Lodge to Lodge Skiing program. The article by Jim Gorman, "Pushing the Boundary," is about his ski trip between Bearskin Lodge, Poplar Creek Guesthouse B&B, then along the Banadad Ski Trail to the Croft Yurt and ending at a Gunflint Lodge. In describing the Gunflint Ski Trails Gorman writes, "In the Midwest and possible in the nation the Gunflint Nordic Trail system's fusion of wilderness and creature comforts is unrivaled and no portion exemplifies this like the Banadad. The Gunflint's Lodge to Lodge Ski Adventures is offered through Boundary Country Trekking. The postponement of the John Beargrease Sled Dog Race from January 28 until February 25 was news in Anchorage Alaska. KTVA-TV, Anchorage, cited the lack of snow along the race route from Duluth to the Gunflint Trail and back for the delay. However, while the lack of snow along much of the North Shore many be true, on the Gunflint snow depth while less then normal are adequate with eight to ten inches on the ground. This morning the Cook Country Board will be consider a draft ordinance on ATV use on roads throughout the County. After consideration of the ordinance today the County Board must next have it presented at a Public Hearing before it can become law. (2) All of County Road 8. 2. Persons operating ATV's on county road right-of-ways as permitted by this ordinance shall not operate the ATV at a speed in excess of 30 m.p.h. 3. Operation on county road right-of-way requires possession of a valid driver's license and being in compliance with State and Federal statute and regulations as amended. 4. Operation must be on the extreme right hand side of said road. 5. Operation is limited to daylight hours (1/2 hr before sunrise until 1/2 hr. after sunset). 6. County roads which are open to ATVs may be posted as closed by the County Highway Department for construction or safety purposes as determined by the County Highway Department and after consultation with the County Sheriff." The Gunflint Trail Association, the Gunflint Scenic Byways Committee and many residents of the Trail have expressed their opposition to allowing unrestricted use of ATVs along the Gunflint Trail. While the proposed ordinances does restrict ATV use along must of the Trail it would allow ATV use in the mid trails area from about Trail Center to Old Northwoods Lodge and along all the Gunflint's County side roads. According to news reports the ATV club would like the limitation on daylight hours eliminated from the draft. As for daylight hours what daylight hours as propose actually mean is that in the summer ATV travel would be allowed from sometime around 6:00 am. to 9:30 p.m. The club also argues that state law already ready allows ATVs to drive along the shoulders, ditches and side banks of County Road. It is unclear in the draft ordinance if within the portions of the Gunflint Trail where ATV would not be allowed, whether ATVs could still travel along the shoulders, ditches and side banks. Allowing ATV use in such a manner would make the prohibition on traveling along the Gunflint Trail meaningless and would result in the destruction of the much of the scenic vegetation along the sides of the Gunflint. All Gunflint Trail residents and friends of the Gunflint are urged to contact the County Board and Commissioner Jim Johnson and the if you are concerned about this important Gunflint Trail issue. Grand Marais, MN The Gunflint Trail Association is pleased to announce the dates for the Third Annual Winter Tracks Festival. Planning is underway and the 2007 Winter Tracks Festival is scheduled for March 1 to 4, 2007. This festival continues to celebrate the best that Minnesota winter has to offer; in classic Gunflint Trail tradition. Activities throughout the festival include cross country skiing, snowshoeing, snowmobiling, dog sled rides, races and contests, seminars, guided hikes and tours, a variety of unique dining options and shopping. Events are for the entire family. New activities in 2007 will include skijoring, geo-caching, curling and quin-zhee building. Grand Marais, the gateway to the Gunflint Trail, this year is offering additional activities during the Winter Tracks Festival. The Sivertson Gallery will feature artwork of Canadian Inuit, Siberian Yupik, Alaskan Inupiaq and Yupik artists. The North House Folk School will offer a 2-day workshop weaving birch into baskets, shoes and hats. "This is classic winter fun at its finest," says John Bottger, Winter Tracks coordinator. "There is something here for everyone. We realize that lots of folks need some how-to when it comes to the winter arts, so this year we are offering a variety of "intro to" events to get them started. All of us who live here love winter, and we want to share some of the fun and excitement with the rest of the world." The festival is open to the public and guests of Gunflint Trail and Grand Marais resorts, and most of the activities are offered free of charge to registered Winter Tracks participants. The Gunflint Trail, originally a footpath for Native Americans to get to Grand Marais, is a 60 mile paved road that runs from Grand Marais to Saganaga Lake through the Superior National Forest and adjacent to the Boundary Waters Canoe Area (BWCA). The Gunflint's 200 kilometer Gunflint Nordic Ski Trail System is recognized as one of North America's finest ski trail systems. Snowmobilers can travel up to festival events along the Gunflint Snowmobile Trail from Grand Marais. The resorts and outfitters of the Gunflint Trail offer a variety of lodging options, plus dining, shopping and plenty of friendly hospitality. Information on Winter Tracks and a calendar for the 2007 events can be viewed at http://www.wintertracks.com. Congressman James L Oberstar -- The American People Are Putting Congress Under New Management . Editors note- Let us hope we have a new direction in Washington and included in this new direction should be getting out of Bush's ill-conceived, costly and endless war in Iraq! The following entry by Jerry Parsons was written in the Log Book keep at the E. J. Croft Yurt on December 19, 1985. News Years Eve day started with a light rain but by four in the afternoon the rain had turned to snow. The snow continued through most of the night. By morning three inches of heavy wet snow had accumulated on the ground. Ski trail groomer, Jim Raml and Ted Young were dispatched to open the Banadad on New Years Day. The groomer were able to track the entire Banadad but reported that because of the heavy wet snow they encountered, "a lot of side brush leaning into the trail along approximately six and one half kilometers of the thirty kilometer trail." The groomers were able to cut some of the brush and noted, "that the trail is passable but skiing will be slow along the trail's brushy sections." The groomers also reported that the track they set while not great is at least fair. Young encountered four skiers on the west end of the Banadad. The skiers stated that while the trail was brushy the skiing was very good and they were having a good time. They were skiing from the Croft Yurt to the western trailhead where their car had previously been shuttle by Boundary Country Trekking. The following day the new tracks were set on the Lace Lake and Seppala Trails was competed. 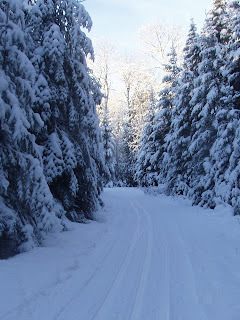 The thirty kilometer Banadad Ski Trail and ten kilometers of adjoining trails are maintained and groomed by Boundary Country Trekking under an agreement with the USFS and supported in part by the Minnesota DNR's Ski Pass Program. The Poplar Creek Guesthouse B&B, the Little Ollie Ski-in Cabin and the Tall Pines Yurt are located on ski trails leading to the Banadad's eastern trailhead. The Croft Yurt Camp is located midway along the Banadad.